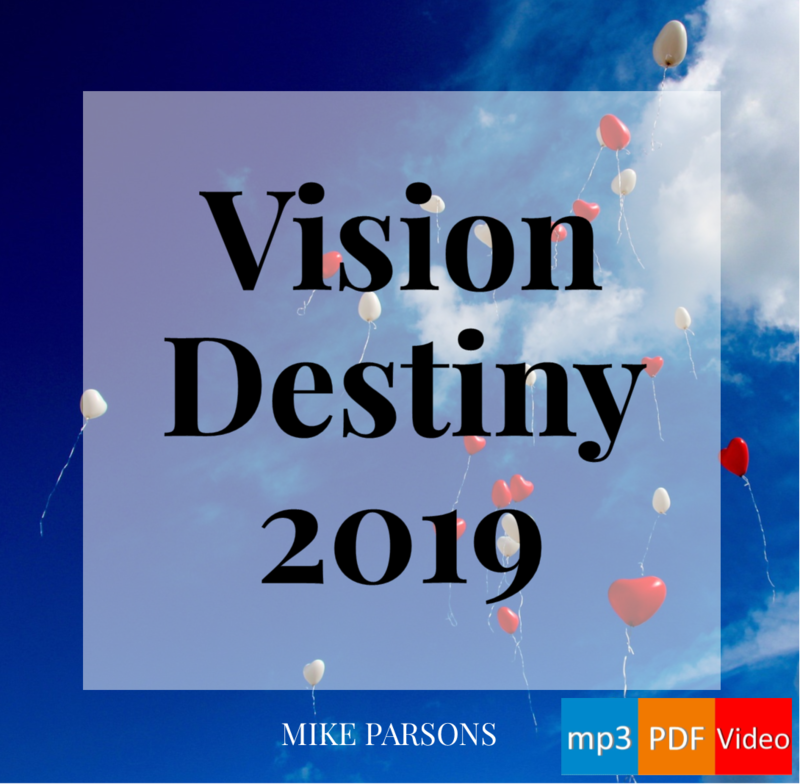 On this blog we are just at the beginning of a new series of posts about preparing for our destiny. 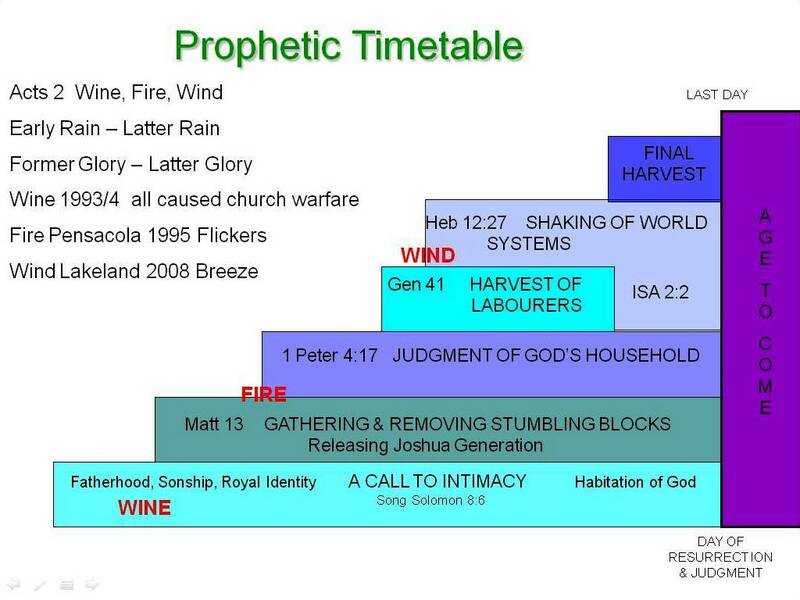 We prepare according to God’s Prophetic Timetable of events for the future, so that we will be ready for what he is doing and ready to play our part in it. From a place of intimacy with God, we will allow Him to change and transform our lives, removing from us everything that is a hindrance or a stumbling-block. He is raising up a Joshua generation who will press into their own inheritance, and lead the following generation into receiving theirs too. We need to receive that inheritance so that in the situations we will face in the coming days and years, when the world’s systems have broken down, we will be ready with the supernatural power of the Holy Spirit operating in our lives. We must be like Jesus: He brought the kingdom, and He calls us to do the same. Man’s destiny has always been to rule, to bring heaven to earth (Gen 1:28). We bring the rule of heaven to earth so that we transform not just this planet but the whole of creation – our universe and even beyond that – which is groaning and longing for the sons of God to be fully revealed. Psalm 24:7 says ‘Lift up your heads, O you gates’. It is talking about us being lifted up to that place of rulership and authority, so that we become a gateway for the King of Glory to come in and fill this world through our lives. That is what God wants to do through us: everything He is, grace, power, mercy, would be channelled through us, and that we would manifest them here on earth. This involves a progression of relationship and of levels of authority and responsibility that would bring us to our sonship. We live here on the earth, with the atmosphere of the earth around us. In that atmosphere at present are the principalities, powers and rulers of wickedness. It is a kingdom in darkness. We ‘walk in His ways’ here, and we recognise that the kingdom of God is within us, but that we are also connected to the kingdom of God realm in the heavens. As we keep the laws, the principles of the kingdom, as we administer righteousness and justice, so we learn to be lords, kings, and sons at that level in the heavenly realms (and also within us). Once we understand who we are and what our identity is, we can start ruling the house (our own house, but also the house of the Lord). Then we can start judging the courts. The kingdom has foundations of righteousness, and justice, and it is God’s people who are eventually going to judge angels, and fallen angels. We have a right to bring judgment to change things in this realm, and eventually to have access to stand among those who are operating in the heaven of heavens. When we start doing that, we remove those hierarchical authorities from the atmosphere of the earth, and we can rule. We rule in light, rule in love, rule in righteous power. The influence we have in the heavens will be manifested here on earth. God wants us to understand and to access those realms. The more we do so, the more we will bring the kingdom of God on the earth, both in us and through us, so that we shine with the glory of God. That will deal with sickness, disease, poverty – all the things the enemy has done to rob God’s people (and the world) of their inheritance, and all that stolen inheritance will be restored. We will manifest the rule of heaven on earth, just as Jesus did. I closed yesterday’s post by calling forth people’s destinies, to fulfil that purpose of God for their lives. That calling forth of destinies is something written on my own scroll. Fulfilling their destiny is important not only for the individuals themselves, but also for the church and the purposes of God going forward. 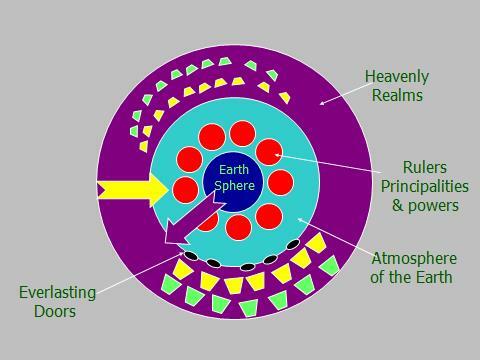 Here is a diagram showing the sphere in which we live, the sphere of the earth, and the atmosphere of the earth that is around us. Within that atmosphere there are principalities, rulers and powers. Then there are the heavenly realms. These doors were open in the time of Adam, but they were closed when God set the cherubim and the fiery sword to prevent him having access to the Tree of Life. When they are closed, they block the way between the two realms. Within the heavenly realms there are mountains and thrones of authority. Every church has its own mountains and thrones of authority, seven of them, but so too do each of us in our own lives, in the Kingdom of God heavenly realm. We are supposed to rule there, and to bring heaven to earth. We have access to the Kingdom of God because it is within us, as well as being in the heavenly realms. When we are ruling there, it enables us to bring the glory of God down from that realm into this one. We must see people raised up to occupy those dimensions of rulership in the heavenly realms. When that happens, the principalities and powers and rulers get forced out. When we just bring the light that is in us and the light of the presence and the glory of God into that realm, then they cannot stay there. Darkness cannot remain in the presence of light. If you put a candle into a dark room, it is no longer dark. You cannot add more darkness to smother that candle, but you can bring more light in to dispel more of the darkness. The brighter the light, the more the darkness has to go. We need to bring the light of God’s glory from the heavens into the earth. The devil is called the ‘prince of the power of the air’ (Ephesians 2:2), but only because we have not yet taken back that realm. So as we start to fill and occupy that space in the atmosphere of the earth, bringing the authority and rulership of God there, the everlasting doors are opened. When they are, we start to see the manifest presence of God in our midst. We usually call it ‘revival’. There are everlasting doors associated with each of our mountains of authority. We have seen that we have seven mountains of authority, seven spheres in which God has called us to have influence. Within each mountain is a mandate from God, and there are thrones upon those mountains, from which we are to rule. A measure of God’s glory? As we have begun to see people raised up to rule on our Freedom Church mountains, and on the mountains in their own lives, we have begun to see a measure of the glory of God coming down through those everlasting doors. We see salvation, healing, deliverance; we see the angelic operating here, and the presence of God’s kingdom manifesting in our midst. But we want to see God’s glory filling this area, transforming our community, the fullness of God’s kingdom being manifested, and at the moment that is not happening. We are seeing a little here and there, now and again. Some of the time, when someone brings a prophetic word, or comes from that realm of authority, we have a manifestation of the glory of God, but it is not there continually. Sometimes we see miracles, sometimes we see healing, but not enough. And I know that it is the same elsewhere too. If we want to see these things happen consistently, we need people raised up as lords to operate in authority on those mountains. We need them ruling and bringing the keys of the kingdom, and using the declarations of authority that they have been given. Then we are going to see full blown revival which will not stop. So there is a task to be completed, and it is what this blog and the other resources we have available are all aimed at bringing about: to see people raised up to occupy those places of authority. There may be much that you need to learn, and protocols to understand and operate in, whether you are ruling on your personal mountain, or on a church mountain: but with practice every one who is called to that realm can learn these things. That will change the atmosphere of the earth from darkness to light. The enemy will do all he can to prevent it, but the only authority he has is what we give him. Our attitudes form an atmosphere around us which operates in the spiritual realm to draw things towards us, whether good or bad. Fear is always the number one weapon he uses. But there are also specific things he will use to block each everlasting door, attitudes and strongholds which specifically oppose the area of authority concerned. Our strengths in those areas that God has called us to can also be our weaknesses, because the enemy will attack them. Ultimately, this is about us all surrendering our lives. It is about allowing God to purify us and refine us and bring us into a place of holiness, so that the authority that our sin gives to the enemy is removed. And God is challenging us to do that now, bringing us to a place of refinement and purification. We will see open heavens, blessing, and a harvest. We will see transformation. We will see the glory of God streaming in through those everlasting doors. We will see people raised up to occupy their place in the heavenly realms. You can be among them. That is our mandate: to encourage you and teach you how to come into that place. The kingdom of heaven is at hand. Everything we need to fulfil our destiny is within His presence and within our relationship with Him. We have seen how we need to take the testimony of what God has shown us, given us, and done for us, and plant it in the garden in our hearts. But planting alone is not enough: if we want to produce fruit, we are to tend and keep what is growing there. And that means we have to cultivate a relationship with God on the inside. If you do not yet know how to do that, you can learn. It is all about practice, and really no different from relating with God anywhere else. If you can sense God’s presence in a meeting, you can sense His presence on the inside when you are in worship in your own life. We train our senses by practice. Some of the people in the church here in Barnstaple who two years ago were saying, “I can’t see anything. I don’t get any of this stuff” are now seeing angels and having the most amazing heavenly encounters. They have trained their spiritual senses to perceive the spiritual realm. In the natural realm we have all learned to interpret what enters our eyes. It is no different with seeing in the spiritual realm. Actually, we all had this ability to see spiritual things when we were very young (how many stories are there of children seeing angels? ), but most of us lost it. We need to recover that ability and start to see spiritual things again. I am using the word ‘see’, but please do not get too hung up on that word. Really I mean ‘perceive’. Some people are very visual, and they will describe it as ‘seeing’, but others will become aware of what is going on in the spirit in different ways. Angels, atmospheres, the four faces of God we are encountering in our meetings – you can train your spirit through practice. I am pretty sure you will have been able to do that. That means you have an imagination. “But I’m just imagining it”. Good. Your imagination is the screen on which God projects things, like vision, and heavenly experiences. And our imagination can convey sounds, sensations, fragrances, tastes, and textures, as well as visual things. That is how we can know what our garden is like, and that is how we can experience the heavenly realms. We can also use the screen of our imagination to open up what we read in the Bible. That is an experiential way in which we can use it as another means of access into the realms of heaven. I want to encourage you to open up your heart, and be willing to get into training. We will help you, on this blog, through the YouTube channel and with our other resources, so that your senses can learn to discern the things of the Spirit. as well as see naturally from the outside in. and to see what is on that scroll that has been written before the foundation of the world. to fulfil that purpose of God for their lives.